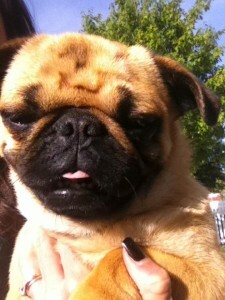 Rucus is a very adorable pug and loves to cuddle and can’t wait to come into your home and get LOTS of attention. Rucus needs to be in a home with a dog. Rucus’s name has been changed to Franklin, which just seems more fitting. :) He is SO cute and has adjusted perfectly to his new home! For the first couple days at our house he was quite congested, not too excited about eating dog food, and had a couple of accidents. However, he caught on quite quickly and hasn’t had any issues since. We were sort of worried about the eating issues… we’ve never seen a pug before that doesn’t like to eat! Haha. But, he was drinking fine, so we figured that he would be okay; which, he was.